Many kids dream of having a Jollibee party for their birthday. Some kids want to have a taste of their favorite Langhap-Sarap meals on their special day. Other kids just want to see Jollibee and his friends in their birthday parties. Jollibee understand this dream of the kids that is why they made it easy to plan a Jollibee party. Jollibee created the Party Planner to make it easy for people to plan their desired Jollibee party. You can now plan your Jollibee party by going to the Party Planner website. There are six steps to plan your Jollibee party, which are the following. Step 1: Find a Jollibee Party Store. Not all branches of Jollibee can host a party. So, the first step in planning your Jollibee party is in finding the store that is suitable to you requirements. The good thing about Jollibee's Party Planner is that it gave all important information about its party stores. 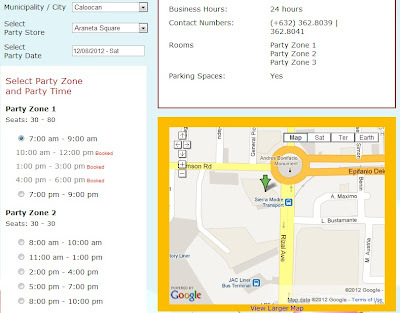 It shows the available time and "Party Zones" for each store. 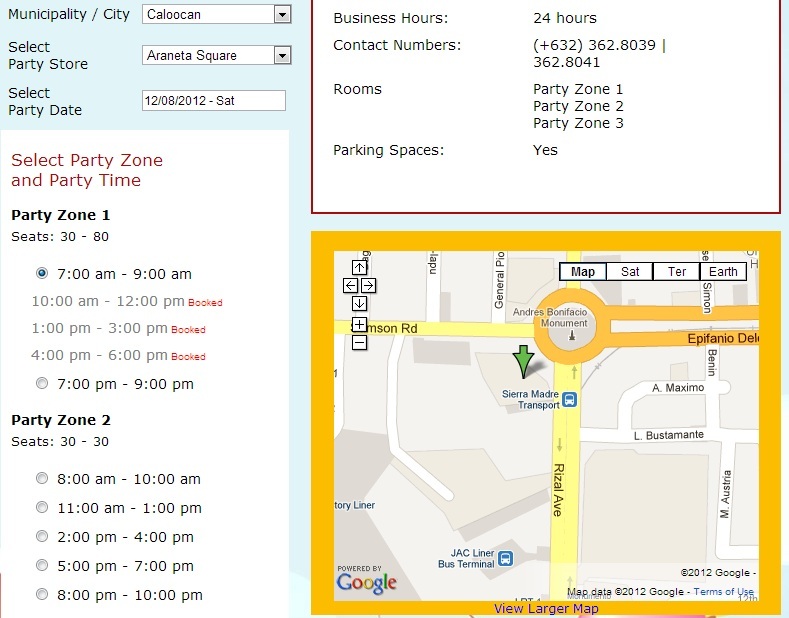 It also shows the availability of the Party Zones. Businesses hours, contact numbers and info on parking spaces were also included. Jollibee also placed a map (powered by Google) so as to make it easy for party planners to find the Jollibee branch. Just click the "Proceed" button at the bottom of the page once you find the Jollibee branch that you want and chosen the party zone and time. Step 2: Choose the Jollibee party theme. 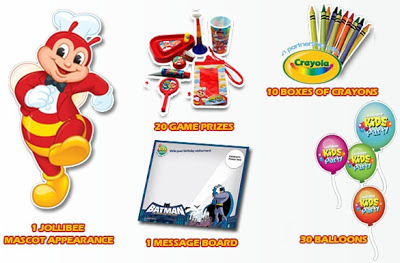 Jollibee party theme adds color to your party. This step allows you to pick from one of the four Jollibee party themes that you want. The four party themes are Jollitown theme, My Bestfriend is Jollibee theme, Barbie theme and Batman theme. 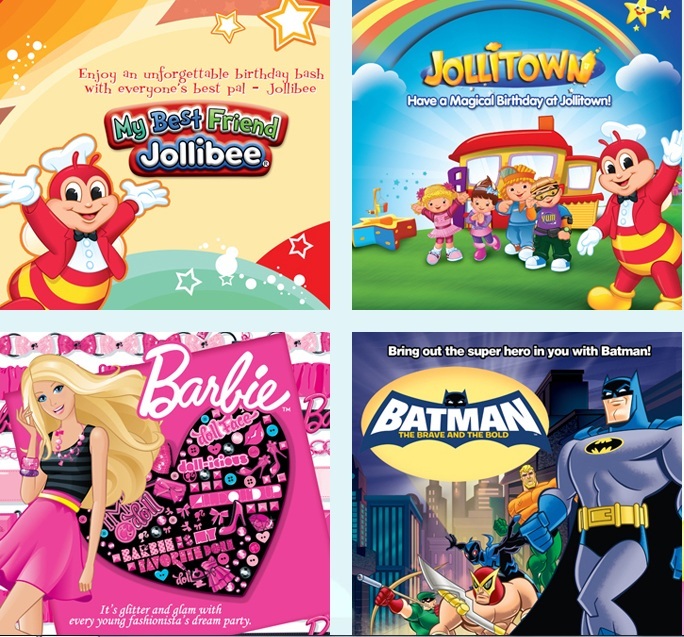 Know more about these party themes by reading my blog post on Jollibee party themes. 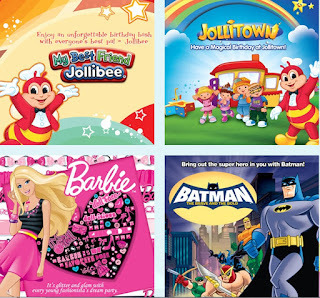 The available Jollibee party themes. Step 3: Indicate the number of guests. Indicating the number of guests to your party is important because it determines the total cost of your Jollibee party. The minimum number of guests for a Jollibee party is 30. You can increase that number in the Jollibee Party Planner by moving the slider to your desired number of guests. Step 4: Add party favors and other fun items. You can add more party favors by clicking on the items that you want. Other party favors are party hats, invitation cards, tray liners, name tags, and loot bags. Step 5: Choose your food package. There are five food packages to choose from. Each package caters to the kind of party that you want. Read my blog post on Jollibee party package to know more on the available food packages for Jollibee party. Step 6: Choose your food add-ons. Are there other Jollibee food items that you want to include in your party? This step allows you to add food items not included in any of the Jollibee party package in Step 5. Cakes are important part of a birthday party. This step allows you to choose and modify the cake that you want to be served at your Jollibee party. You can choose between chocolate and mocha flavored cakes. Cakes are provided by Red Ribbon. You can also indicate the message to be placed on the cake on this step. Special instructions for the cake is also written on this step. The last part of this step is placing your name and contact details. Please note that the contact person should be in the Philippines. 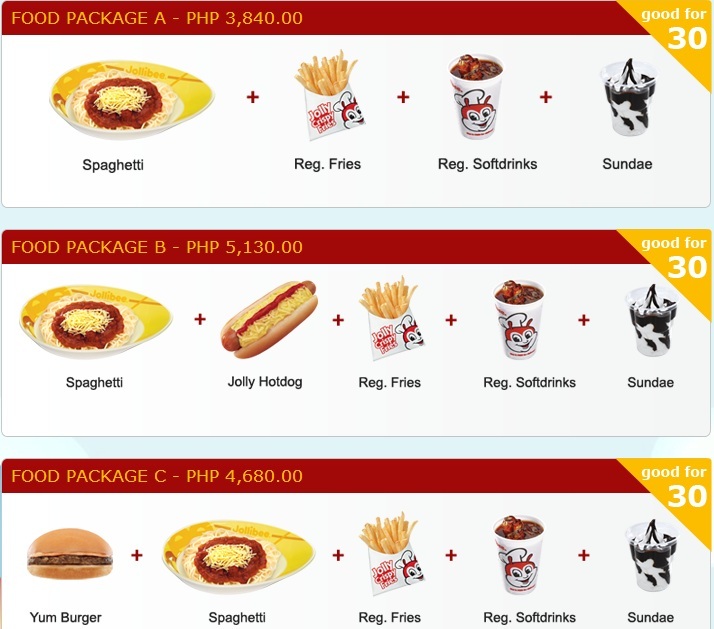 Before you go to the last step, Jollibee party planner will show you the summary of your party. This will give you a chance to see if you miss something or you already exceeded your budget. The Summary Page also give you the chance to add Jollibee mascots for your party. This is the final step for Jollibee party planner. 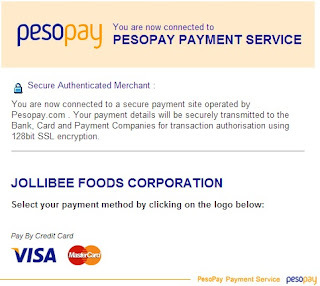 Jollibee will give you the option to pay in full or pay the minimum downpayment of 3,000 pesos. Online payment is paid by credit card from Visa or Master Card. So, these are the easy steps in planning a Jollibee party. Do you have any question? Please tell us your question by leaving a comment on the combox. ask ko lang dunsa create a meal pwede ba na ung wala dun sa choices na nasa brochure? like spag with chix? fries, sundae, sofdrinks for kids, then spag with chix 1rice, drinks for adults? Yes. Pwede po. Ikaw ang pipili ng gusto mong food item. hi plan ko po na icelebrate ung 3rd birthday ng anak ko this coming june sa jollibee...meron akong 40 na adults and 25 kids.. naiinvite..
Hi! About sa payment. Yung credit card ba pag pinili ko yung full payment maiging installment ba yun? Or isang buhos yung payment? hi papabinyag ksi ako dis Dec 15 how much aabutin mga 30 persons lng..thanks!!! Marami po kasing factor ang computation ng total cost ng Jollibee party. I suggest na pumunta na lang kayo sa Jollibee Party Website at duon na lang po kayo kumuha ng estimate. how can I make reservation for my son party? 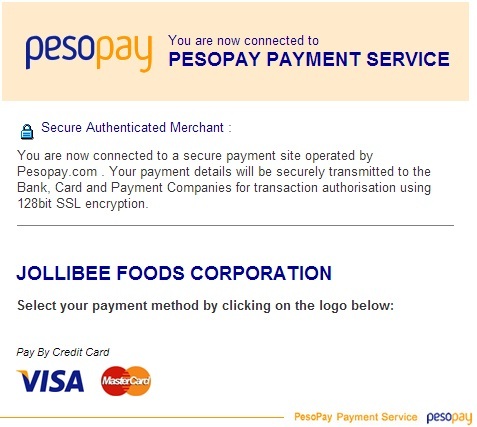 You may reserve and plan the party through the Jollibee Party website: http://jollibeeparty.com/ or you may inquire at the nearest Jollibee store. I suggest that you contact the manager where you will hold the Jollibee party. He is more knowledgeable than me on this matter. I suggest na ang puntahan mo yung website ng Jollibee Party. Makakakuha ka ng estimate dun. Makakapamili ka pa ng gusto mong items para sa party. Hello po..maraming salamat po sa impormasyon na pinahayag nyo po na.makikita sa website. Pwde na po.mkapag sayasat na po ako sa ibang impormasyon na gusto malaman na hind ko na kailangan pumunta ng personal..
Walang anuman. Ako po'y natutuwang nakatulong. Ang mabuti po ay kausapin ninyo ang branch manager dahil siya lang po ang makapagbibigay ng sagot. I suggest po na gamitin na lang ninyo ang Jollibee party planner para malaman ninyo kung magkano ang gastos. At saka walang Little Mermaid Theme and Jollibee Party. Hi..juz wanna ask I'm planning to throw a party for my nephew.. I'm choosing the food package #4 and my best friend Jollibee team..but is it possible to do it some other venue and how much it will cost?